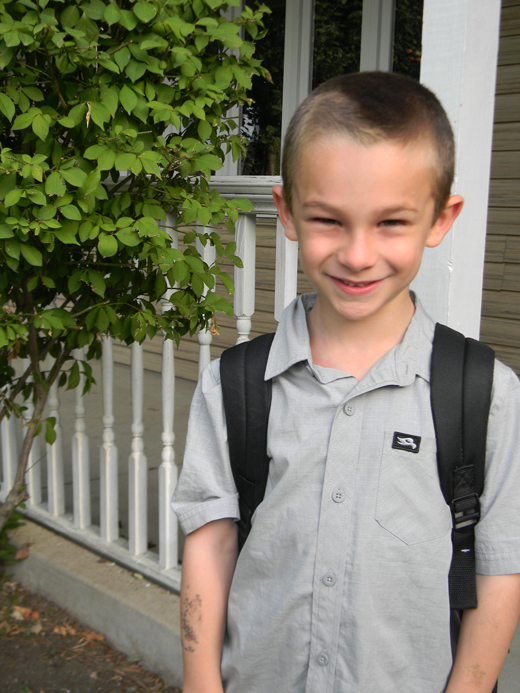 On Monday, this not-so-little-anymore guy started first grade. For Kayce, this will be his first “full” days of school. Pre-school was a handful of hours two days/week. Kindergarten upped it and he started going every day, but again only for a few hours. Three days in to first grade and he is definitely coming home exhausted. The adjustment will take some time, but obviously a necessary one. On the whole, this is our first child to be gone all day for the majority of the week. It’s not so hard on me because I’m off making widgets. For Dawn though, it’s a big change. This is her “baby” and having to share him with the world is not always an easy transition. Likewise for Conor. Since birth, Kayce has been by his side. If not for the look and slight age difference, you would think we had two sets of twins the way. If you are a stranger to our family, Kayce and Conor are always together. One does not go anywhere without the other. Which, as a parent, feels like a big accomplishment. When siblings are as close as you imagined they might be. Conor is too young to grasp the concept of Kayce being gone at school all day. So when the day finally came his world got turned upside down. Reports are he has been following Dawn around the house like a lost puppy. Luckily, his school starts back up next week. We went ahead and signed him up for an extra day/week and slightly longer hours. He could use it. Because of his late birthday, he’ll have had 3 years of preschool under his belt when all is said and done. He needs a good challenge. Despite the OBVIOUS importance of school, this latest milestone has been a mixed bag of feelings. It’s indescribable to watch your child grow, mature and become more self-reliant. At the same time, we selfishly wish they would stay young and innocent forever. I never understood the desire to home school children, but now I do. Love this little guy. I am so proud of him. Wow—1st grade for Kayce! These years have flown by! So, so proud of you, Kayce G! Yay Kayce! I cannot believe that you are in first grade already! You are going to do AMAZING. I cannot wait to hear throughout the year how much you love it!